This year holds many exciting moments for Steel Guitar and you don't want to miss any of them. 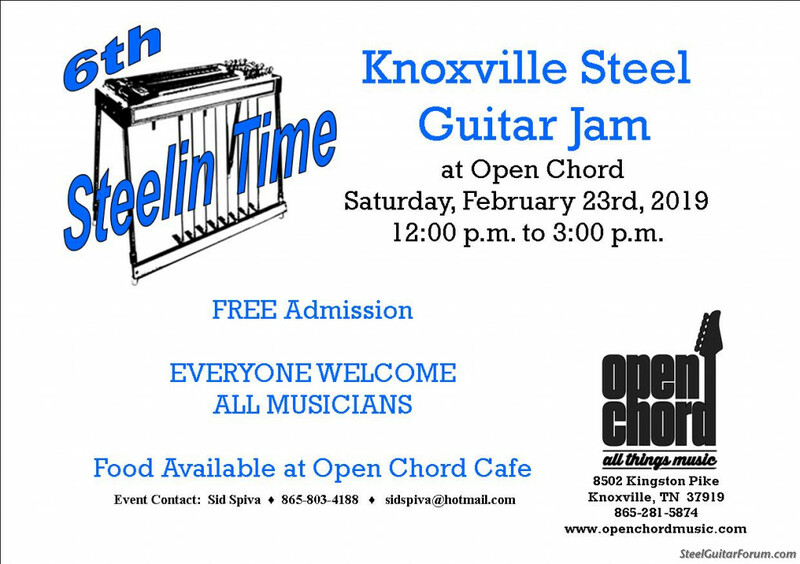 Mark you calendar for the next Knoxville Steel Guitar Jam, Knoxville Tennessee, on February 23, 2019. Come join in on the music, fellowship, and fun of great event. Time is drawing near. Is a player schedule available yet? PS: If anybody is interested in my 112 knob guards, I can bring them to the show. No shipping, so $10.00 each. If anybody is heading up I-81 after the show, I will be playing at a family friendly place from 7:30 until 10:30, a couple miles off of exit 23. Greeneville/Bulls Gap. Only one week away. Looking forward getting to pick with Steve Leonard. Hey Tony, I am looking forward to it too. We are going to have fun! Well, I will have fun watching you two guys have fun. Hey George, it will be good to see you again.